Is Woodchester Mansion really haunted..? Woodchester Mansion stands lost, almost forgotten in Gloucestershire's countryside. Described as beautiful, frightening, abandoned yet compelling, it stands on the site of an earlier Georgian manor house. Surely a building that's never been lived in couldn't possibly be haunted, could it? People have claimed to have seen strange blue and green spirit "lights" coming out of the bare walls, with deep rumbling noises and light tapping, as well as a discarnate voice saying "I want to go home". So who may be causing this strange phenomena? Two vastly different spirits are known to be constantly grounded. One is the spirit of a French stone mason. Mediums have come up with two possible stories for his demise, one being that he was struck on the back of head by a large piece of rubble and was crushed to death. The reason is that he was murdered in the tool room with some kind of bladed-object, causing the remaining workers to up-and-leave. Interestingly enough an EVP experiment conducted onsite has actually captured French voices! The other spirit is of William Leigh, who spends most his time in the incomplete second floor corridor and the cellar. 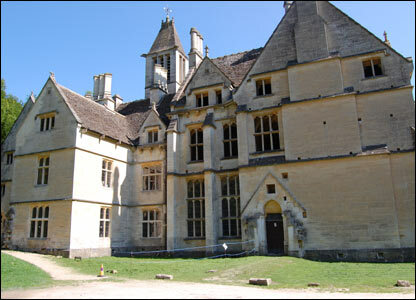 According to mediums, he still sees Woodchester Mansion as his home and gets very annoyed when people trespass. He's been known to thrown surprisingly large stones, move doors and make gruesome groaning and wheezing noises.